At last the lawn has grown enough for me to cut it for the second time since autumn, my team of lawn mowing guinea pigs can’t eat it fast enough. 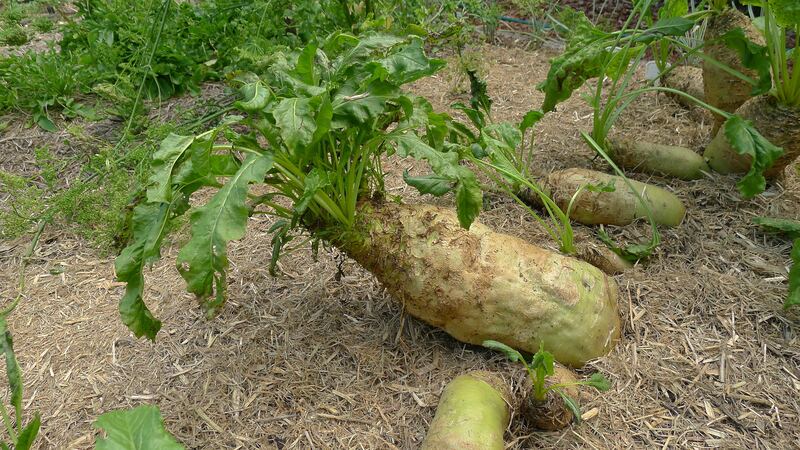 The hot, humid – and recently wet – weather is bringing a fine crop of mangelwurzel, beetroot and silverbeet to a close, they just can’t cope with bacterial and fungal diseases of a subtropical summer. So it became necessary to invent Jerry’s summer root salad. As cool season winter crops make way for warm season crops, the juvenile Elephant’s Foot yams (Amorphophallus paeoniifolius) have sprouted – and I’ve repotted them. This is emerging as a useful starch staple crop from subtropical and tropical gardens around the world, but it has long been an important staple in South Asia. It is also native to tropical Australia where it has been grown for millennia. It’s time to regenerate my cocoyam bed (Xanthosoma saggitifolia) using stem sections and tip cuttings, to sow fodder corn corn for the guinea pigs’ supper and ‘Red Aztec‘ for the household. Each season I check through my seed bank checking the dates when seed was saved, looking for things that need to be sown before they get too old. From this I sowed Puya mirabilis, an ornamental bromeliad, and Teosinte (Zea mays subsp. mexicana) a perennial wild corn. I hope to re-bank seed from my Teosinte as this is my last seed. The volunteer Italian flat-leaved parsley, heavy with almost ripe seed, have taken a battering from storm winds, so the broken branches are now drying out under the house. Weeks ago, I bagged seed heads taken from my winter crops, like Dai Gai Choi ‘Wynnum Imperial’, and I’m gradually getting through saving their seed. The garden is full of bee activity, mostly Blue Banded bees (Amegilla cingulata), which are brilliant pollinators of crops in the Solanaceae family (potato, tomato, chilli, eggplant, etc) but since the catnip (Nepeta cataria) started blooming, Neon Cuckoo bees have joined in the hunt for nectar. On 9th December, I spotted four Neon Cuckoo bees (Thyreus nitidulus) working the catnip simultaneously, a record number at Bellis. Every time you have an abundant crop, experiment with it. Since I have an embarrassment of yam, beetroot, mangelwurzel and silverbeet, I cooked some for a salad. When cool, I combined the diced roots with diced fetta cheese. To bring the dish to life, I made an salad dressing using fresh Tahitian lime juice, olive oil and horseradish sauce. Fantastic! If there’s anything listed here you fancy trying yourself, join the Seed Savers Network. Our seed is free to our members.